Pizza Delicious is Bywater’s go-to pizza place along Piety Street in New Orleans. It is known for its dedication to the creation of the best renditions of the New York Style Pizza. Here, guests can enjoy their thin crust pizza over a beer and a very hipster ambiance. 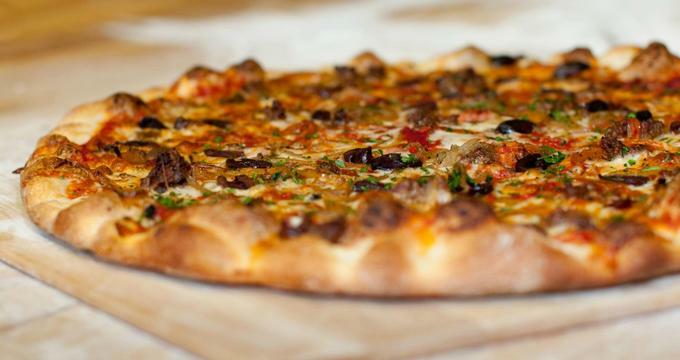 Pizza Delicious offers no reservations. This is because they are a counter-serve restaurant where patrons are accommodated on a first come, first served basis. Orders for delivery and catering, however, can be resorted to as an alternative. Pizza D caters to events of all kinds and sizes. They offer custom menus to help provide for the event’s unique needs and circumstances. Pizza specials are changed weekly, so there is no guarantee that the desired flavor is available at the time of the scheduled event. Pizza D, however, aims to accommodate as many requests as possible. Pizzas are usually 18’ in diameter and are cut into 8 slices. To make sure that there’s pizza for all the guests, it’s highly recommended that each person be allocated with 2 or 2.5 slices for adults, which should vary depending on how hungry the guests are expected to be and what other food will be served alongside the pizza. Orders are best made one day in advance, making sure to indicate the time when the pizza should be delivered. Same day orders are possible but getting the pizza at the exact time needed is more likely if the call is made earlier. Catering can be arranged through email via catering@pizzadelicious.com or by calling 504-676-8482. Just ask to speak to the manager.